Tara’s given us a beauty of a theme this time, My Weekend. Quiet relaxation? Uninterrupted peace and calm? Not quite. SAT 0340 – Get up, go to St Magnus Church in Lerwick, take part in their Bible Reading Marathon. Realise I had my times wrong and didn’t need to get up for another half an hour. Arse. 12 chapters of Deuteronomy in 30 minutes (this is fast, apparently, as they’re a little behind at this point), 10 Commandments, Moses making stuff up as he goes along. SAT 0440 – Run home, last training run before the Simmer Dim Half Marathon on Sunday. SAT 0900 – Go shopping, discover cook book with recipe for dinner is in the back of my car whilst ingredients for dinner are now at home. SAT 1045 – Send wife and number 1 son across to village hall to meet for their coasteering. SAT 1100 – Discover said coasteering started at 10. Fall on my sword. 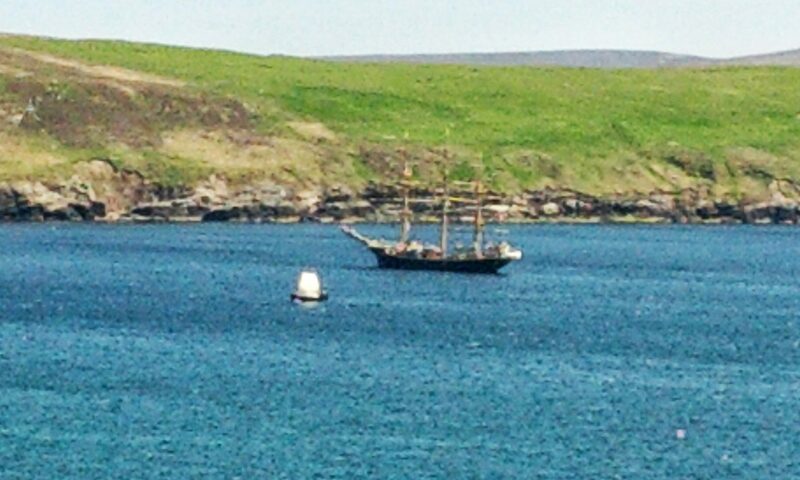 SAT 1145 – Head into town, back to St Magnus Church with Thing 1 for another half-hour of the bible. 2 Samuel. King David’s a right arse and there are some truly historical names in there. SAT The Rest – play with kids, assist in finishing dinner, mentally prepare for Sunday, watch Agatha Christie (how is there one I’ve not seen before?) and much comedy on TV. SAT – 2100-2330 – Stage 1 of Blueberry Gingermead. Racking on to secondary fermenter next Sunday. SAT 2330 – Wife heads off to do her stint of reading. SUN 0100 – Wife returns, sleep follows. SUN 0530 – Up and away for final stint of reading. Proverbs. Interesting stuff, Proverbs, and a very easy read compared to 2 Samuel. Don’t rush, we’re ahead of ourselves now. Decide we’re going to go for a Hobbit/Lord of the Rings reading marathon as a fund raiser next year. Might get a better audience! SUN 0800 – Small breakfast. Pre-run nerves building up now. SUN 1030 – I head down to Cunningsburgh for the half-marathon, Wife and kids off to church. SUN 1100 – 1302:47 – Running half-marathon. 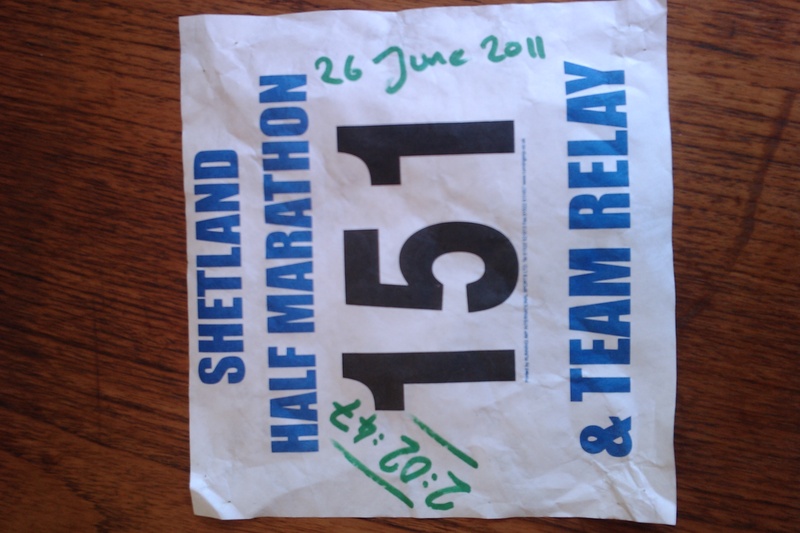 Personal best time in the hottest, stillest weather Shetland’s seen all year. SUN 1305 – 1400 – Recovery swim. Get really, really cold and feel generally crap. SUN – Remainder – Assist in cooking dinner (Jamie Oliver’s 30 Minute Meals fish tagine, 4.5/5), kids to bed, warm bath and cold wine. Bed sometime late. Bloody hell, what a weekend. Only got to get a cat from Wales to Shetland next weekend, piece of cake! Phew! I need a holiday after reading that. Do you ever just lie around on the sofa watching the TV? Or just sit in the pub people-watching? I’d have been dead years ago if I led a life as active as yours. If only we had anything approaching a proper pub up here! We’ve got Scottish pubs, which were basically places to consume “beer” (either from a red tin or a yellow one depending on your preference) and other people’s smoke in equal quantities. Not sure what they do now they’re not allowed to smoke. Drink more, I think. Turn the lighting down so they still can’t see clearly. Anyway, we’ve got 1 pub and it’s well out of the way. The Inn on the Hill is a great place but at £20 each way for a taxi? That’s one reason I brew my own beer. Oh, yes – forgot to add! SAT – 2100-2330 – Stage 1 of Blueberry Gingermead. Racking on to secondary fermenter next Sunday. We do have more relaxed weekends usually, the Simmer Dim weekend is always a busy one, though. You are! That’s not a normal weekend for me! Wow, I am tired just reading it!! I know it’s been said, but I’m just tired from reading that… not even imagining it!! The idea of a Bible Reading Marathon sounds very cool! Previous PostPrevious #RandomWednesday – Who am I again? Next PostNext #CookalongFriday – See you next week!